Air conditioning units heat the bedrooms and the wood burning stove does the living room. We have installed a wood burning stove in the lounge. There are also sufficient electric heaters for the other rooms in the villa for winter lets. There is a fuel supplement for lets between October and March. We also have 1, 2 and 3 bedroom apartments available in Salema. All fully furnished and serviced with glorious sea views. Please telephone for details. Car hire can also be arranged at very competitive rates with cars being available from either Faro or Lisbon airports. We so enjoyed our 10 days of end of summer sunshine at Villa Katyia in Salema. 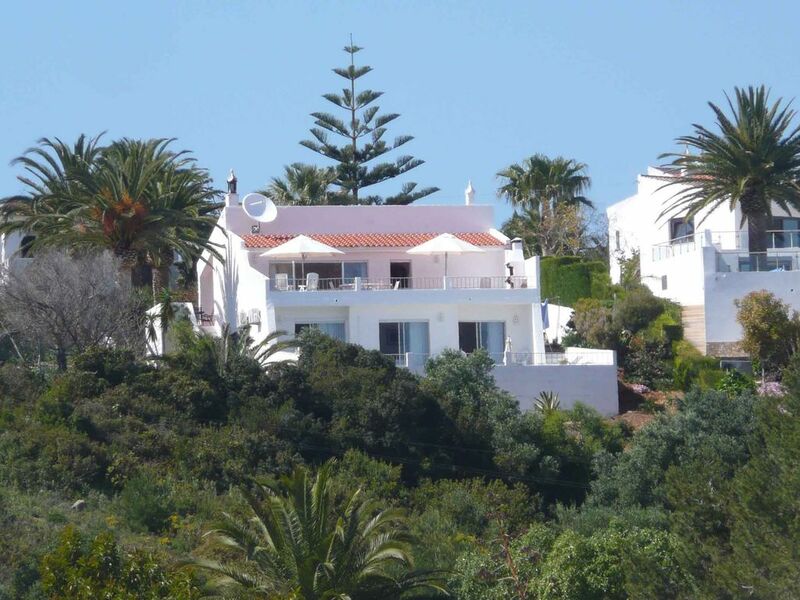 The house is very spacious and well equipped, and the views over the bay and beach of Salema are wonderful. The pool was plenty warm enough for us to swim in. Property is really well equipped, good location and views, plus pool is a decent size. Salem is a nice sized place with a good beach. A beautiful village with a gorgeous view. The villa was very comfortable and well equipped. The top terrace was particularly delightful with a view of salema. We loved our stay at Casa Katyia, it’s a beautiful and well equipped villa with everything you need for a holiday. Stunning views over Salema and a lovely heated pool. Carol and Bill could not have been more helpful or accommodating. We would stay there again. Casa Katyia is certainly the best villa we have ever stayed in! What was particularly nice were the extra touches you do not usually get in holiday villas like beach mats, umbrellas for the beach and adapter plugs. The villa was a real home from home. How nice to have a good sized swimming pool you can actually have a proper swim in and the views from the poolside and upstairs patio were wonderful! We would recommend the surfing and body boarding at Cordoama Beach on the Atlantic coast .We enjoyed eating at the restaurants in Salema including MiraMar. Salema is a working fishing village, situated at the western end of the Algarve. It is approximately 60 minutes from Faro airport, 15 minutes from Lagos and 15 minutes from the west coast. There are a number of courses within easy reach of the villa include, Parque da Floresta, Palmares, famous for its annual Almond Blossom Tournament in early February, and the three courses at Penina, see web site for further imformation.